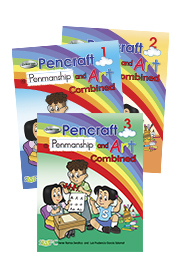 St. Mary's Assessment Portfolio is developed within the content and learning competencies of Mathematics, Reading and Language, Science and Health, Mga Araling Panlipunan, Pagbasa at Wika. The learning material consist of a comprehensive practice test of formative and summative assessment for each learning area. 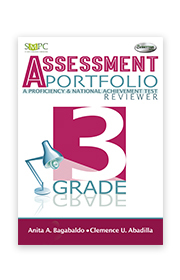 The practice test of formative and summative assessment introduce the students to the format, and content of national assessment administered by the Department of Education. attain mastery of the essential skills in all the learning areas of the grade. provide test - taking strategies that build confidence and lower text anxiety. Writing is an art, so we cannot separate these two activities. If you want to write correctly and nicely, do it artistically. This is the reason why we combined penmanship and art in this worktext. Each lesson is presented step-by-step to enable the learner to follow as instructed with minimum supervision. Tracing is followed by writing to make each one an efficient if not a perfect writer. Practice exercises are provided in every lesson as well as homeworks for further evaluation. Art lessons provide for pupil’s creativity, developing his/her talent in said field. Varied art exercises as well as homeworks give further opportunity to discover the pupil’s ability to draw, color and express his/her artistic talents.